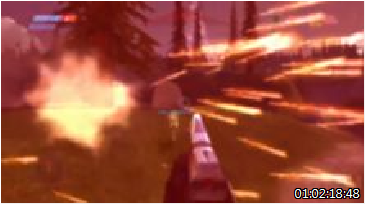 The image shown in the upper left of this screenshot, from Nintendo’s Super Smash Bros., is one frame in a flashing sequence in that fails the seizure safety test. 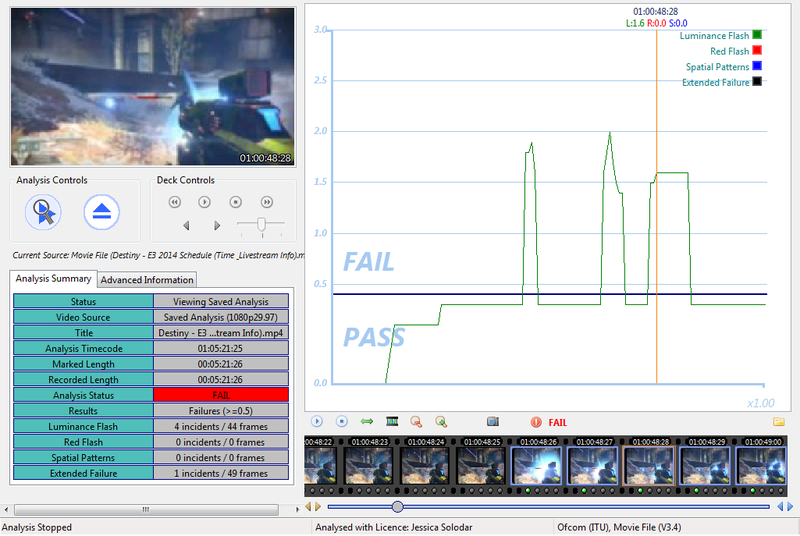 The graph on the right shows the brightness of the flash exceeding the safe limit. The 2014 E3 (Electronic Entertainment Expo) just wrapped up in Los Angeles with all the major game publishers previewing their upcoming releases. The big companies publishing these games have mammoth budgets and should be able to fund some quality control that supports the interest of public health. Apparently that line item is still not getting the focus it deserves. Last week PCMag.com listed the 10 most anticipated games to be announced at E3. How many of them might trigger seizures in people with photosensitive epilepsy? Destiny, a massively multiplayer first-person shooter game to be released in September, fails the safety test, too. Unlike the Nintendo game, it’s a completely new product. 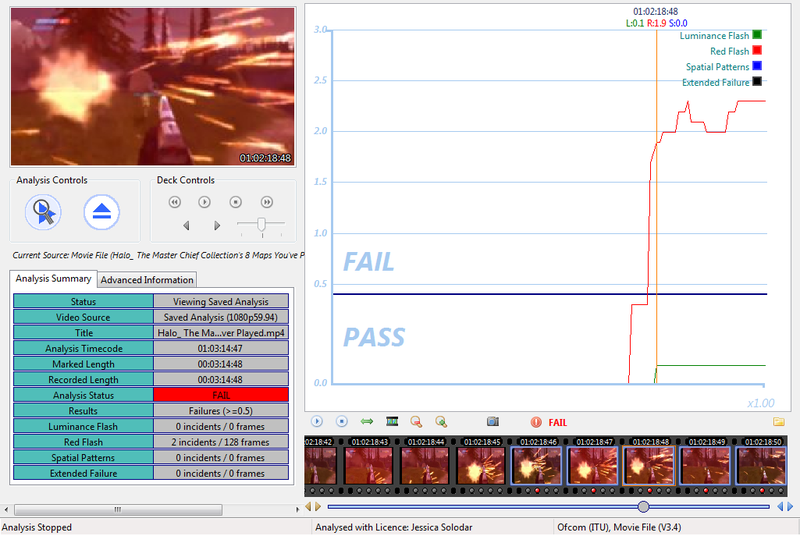 Both screen shots are taken from the Harding Flash and Pattern Analyzer, which tests images for seizure safety. So far, 4 of them tested positive for seizure-inducing sequences–meaning they failed the Harding automated seizure safety test. 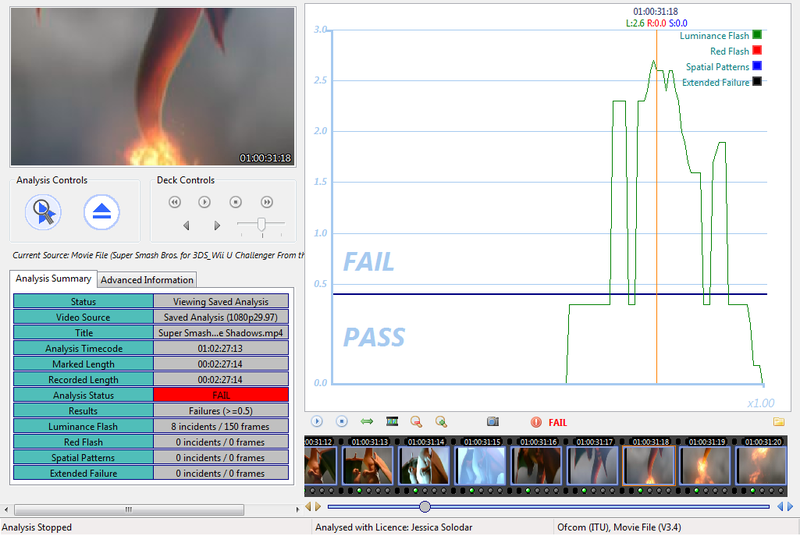 This isn’t a final result because not all have enough “footage” available online for me to test adequately. Some may ultimately seem safe. In other words, the patterns, flashes, and/or red intensity of onscreen images produce the exact type of visual stimulation–that’s been carefully defined by researchers–that places viewers at risk of photosensitive seizures. People with a genetic predisposition for these seizures are vulnerable, whether or not they have ever experienced a seizure before, and whether they even know they have this genetic trait. Nintendo’s Mario games have been triggering seizures for more than 20 years. Reports began surfacing in 1992 about seizures from Super Mario. As a result, a study on video game seizures published in 1999 used Super Mario World to test subjects known to be photosensitive. And a lawsuit was filed in 2001 by parents of a boy who had a seizure while playing Super Mario Kart. But what about new games such as Destiny? A whole new game provides the perfect opportunity to create an entirely novel visual experience. Why not architect the whole thing keeping in mind the seizure hazard that persists in many games? In sum, some of the video game industry’s biggest players are continuing to ignore safety guidelines, placing the public at unnecessary risk. I don’t know where the myth originated that games produced nowadays don’t produce seizures. Can handheld games trigger seizures? Think the screen of a handheld game is too small to provoke seizures? It isn’t. Games on the 2.9 inch screen of Nintendo’s Game Boy Advance SP provoked quite a few seizures in my daughter when she owned one ten years ago. Nintendo’s current handheld is the popular 3DS console, which has a 3.5 inch screen. 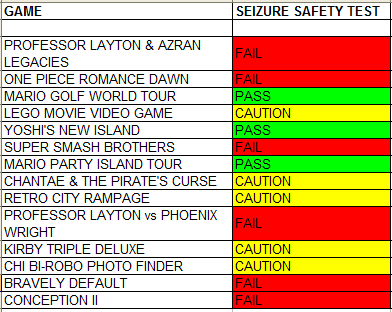 I recently tested some 3DS games to ascertain their seizure safety. The rule of thumb (as it were) is that, for flashing and patterns to trigger seizures, the provoking image must take up at least one fourth of an individual’s visual field. It’s not unusual for kids to hold their portable games at close enough range for that small a screen to fill that much of their total view. 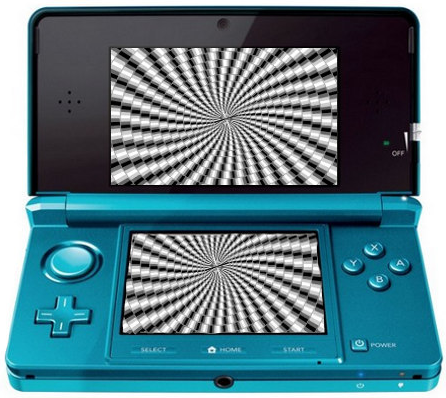 Incidentally, although concerns were raised when the 3DS was introduced three years ago, there isn’t any conclusive evidence that 3D effects increase the risk of seizures in people who are photosensitive. 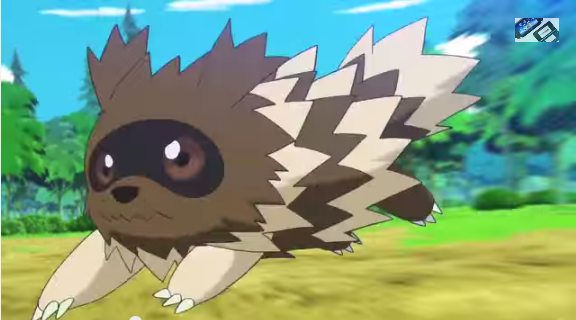 The IGN.com website recently identified the 14 most anticipated 3DS games for 2014 release. Here’s how they fared when tested for compliance with guidelines for preventing visually induced seizures; 6 of the 14 failed, and an additional 5 came close. Tests were done using the Harding Flash and Pattern Analyzer. Yes, there are seizure warnings on all game packages, but the warnings are pretty worthless for consumers. A year ago I posted about Nintendo being fully aware of, but publicly downplaying, the risk of seizures from its games. No consumer has won a product liability/personal injury case against a game manufacturer whose video game triggered seizures. Cases were either dismissed, settled, or won by the game company. Despite their limited usefulness to consumers, seizure warning notices do seem to provide legal protection to game publishers. And juries have a hard time awarding damages to plaintiffs with a pre-existing condition, even if plaintiffs didn’t know of their photosensitive epilepsy prior to the seizure(s) triggered by a video game. In one case Nintendo actually conceded that its game had in fact triggered seizures, but that didn’t get in the way of the company winning the case. A judge later overturned the jury’s verdict because Nintendo had withheld critical information in contempt of court. The cases date back to 1991, but the apparent total number of cases–ten–is pretty small. One has to wonder what percentage of the seizures triggered by exposure to video games are ever identified as visually induced seizures. 1998 LA 13 year-old Joey Roccaforte had clusters of violent seizures Mega Man X (Super Nintendo) Jury ruled for Nintendo; judge later vacated the decision because Nintendo withheld critical information before and during trial. 2001 LA 11 year-old Michael Martin, son of Eric Martin, mayor of St. Martinsville, LA. Seizures that began happening during games began occurring also during sleep. Super Mario Kart (Nintendo 64) Settled personal injury claim; lost case advocating better warnings. 2011 CA Navy F-18 pilot John Ryan McLaughlin injured in a grand mal seizure that causes permanent loss of flight status Oblivion: The Elder Scrolls IV (Bethesda Software), Sony Playstation 3. Still pending; no other information available. In 1997 the criteria for product manufacturer’s liability for a product that has caused harm were revised by the American Law Institute, an independent body of legal experts that drafts and publishes restatements of common law in order to clarify and simplify it. 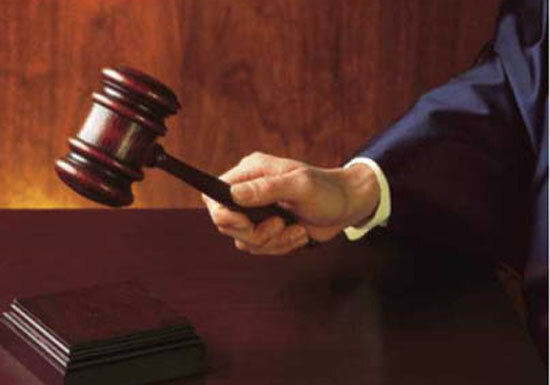 Its work is used as a resource by state lawmakers, judges, and lawyers. Every state has its own laws concerning burden of proof, the awarding of damages, and the like. Some game companies are apparently working to make games that do not provoke seizures, but only Ubisoft has made a public commitment. As far as I can tell, most are merely reworking their warnings. 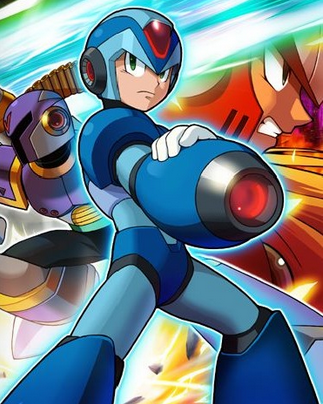 Nintendo’s Mega Man X was one of the four games tested by the BBC for this investigative report that did not meet British TV seizure safety guidelines. A BBC report on Nintendo revealed that the company knew more than 20 years ago which of its games were most likely to cause seizures–and downplayed the seizure risk to customers. A former Nintendo customer relations employee interviewed for the story said that many customers called to complain about experiencing seizures. Because he wanted to advise customers concerned about the seizure risk, he asked the company’s R & D group for a list of the games most likely to cause seizures. 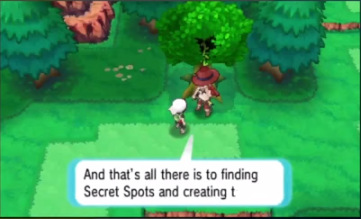 Developers came up with a list of more than 30 games. Before the list was released to customers, he said, the company’s lawyers pared down the list to 12 – 15 titles. As customer complaints about seizures grew, Nintendo stopped releasing any seizure information about specific games. The Nintendo executive interviewed asserted that the company began making its games safer and started including seizure warnings with game instructions as soon as the problem came to their attention—in 1991. The story, featured on the BBC’s Outrageous Fortune program in 2004, also includes an interview with photosensitive epilepsy expert Prof. Graham Harding. Using his own flash and pattern analyzer Prof. Harding shows the results of testing some Nintendo games for seizure safety. To view the ten-minute segment about video game seizures in the report on Nintendo, first go to www.youtube.com/watch?v=0aFhW56c2Vg and fast forward to about 5:15 into the clip. 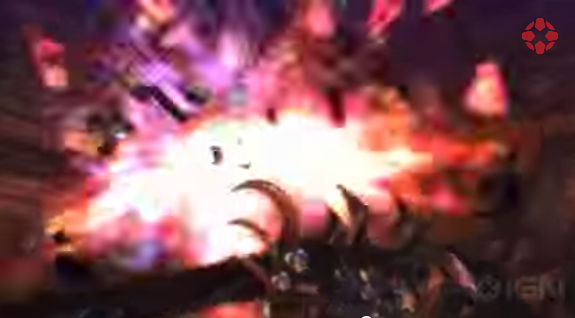 The seizure segment continues at the beginning of this clip. The documentary was never aired in the US, and I’d long since given up searching for it online. But I recently came upon it thanks to John Ledford, who has been tracking seizure lawsuits filed against the game industry. John became blind in one eye as a result of his first grand mal seizure—which occurred while he was playing a video game in 1994.